The four locals arrested the summer at Javelin Park for the offence of "wilfully obstruct a highway with an non motor vehicle" (?!) 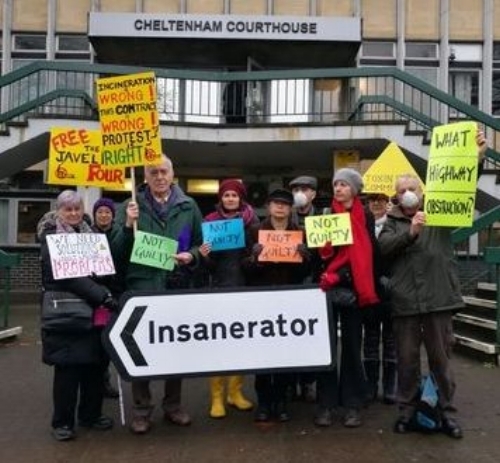 - from left to right with the Not Guilty placards: Martin Stockwell, Jojo Mehta, Joziet Khimba and Gail Bradbrook - outside Cheltenham magistrates court to register their Not Guilty pleas. Press coverage here. A trial date has been provisionally set for 22nd March 2018. This is the current state of the beast, as seen in UBB's latest "community" newsletter, where they proudly declare "much of the concrete construction and groundworks have now been completed, the erection of steel structures that will form the building is well under way, and the process equipment is starting to arrive on site"... This is of course by way of telling us all that it's too far gone to stop now, despite the fact that the Council would STILL SAVE MONEY long term by doing so, and waste policies that prioritise recycling have many advantages over incineration. UBB are feeling the Christmas spirit however... and in compensation for tearing up Stonehouse High Street for the THIRD time in recent years, they have offered "to cover the cost of free car parking in the town across the Christmas period and during the most intensive work period. In addition, we have made a contribution towards funding the town’s Christmas lights". Oh well, that's alright then. It ain't over till it's over. And it's not over.